The lands of Middle Earth can be a truly dangerous place, as well as one that is difficult to navigate. That is why you should not begin any journey into this mythic realm unless you are wearing a pair of your own Map of Middle Earth Wrist Cuffs! This impressive pair of wrist cuffs are lighter than bracers, making them the perfect choice for those who want something that is stylish and stylized, but lacks the definite feel of armor (although they also serve as great pieces of deceptive protection, just so everyone is aware). Crafted from 7/8 oz. 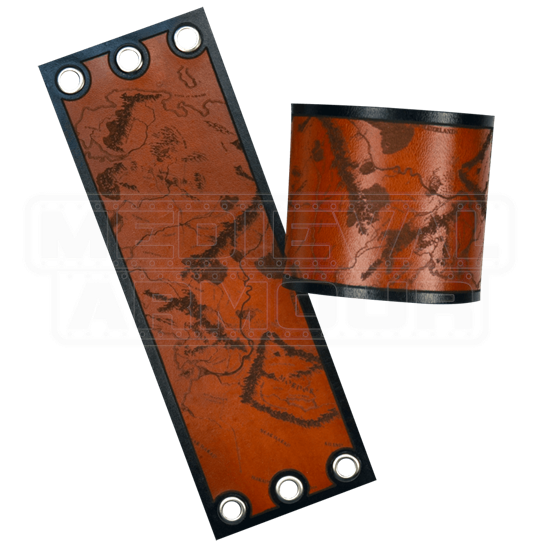 leather, these bracers are hardy in their construction, yet stunning in their design. They are etched and engraved with a partial map of Middle Earth, featuring a stretch of land that ranges from south-eastern lands of Mordor to beyond Gondor and Rohan, extending up past even the Shire. The map is engraved on attractive brown leather, while featuring a black border to help contain the maps boundaries. The cuffs are somewhat adjustable, possessing a trio of lacers along each end, which ensures that with the included leather laces, you can wear your cuffs as tight or as loose as you desire, ensuring you get the fit that you want! These wrist cuffs are hand crafted and made right here in the USA. These Map of Middle Earth Wrist Cuffs are a must-have accessory for any Tolkien fan who wants to take a journey into the lands of Middle Earth, as well as a great piece to add to any Tolkien-inspired costume that you might intend to wear! After all, imagine how successful a journey you might have when you know exactly where you are going AND how to get there!